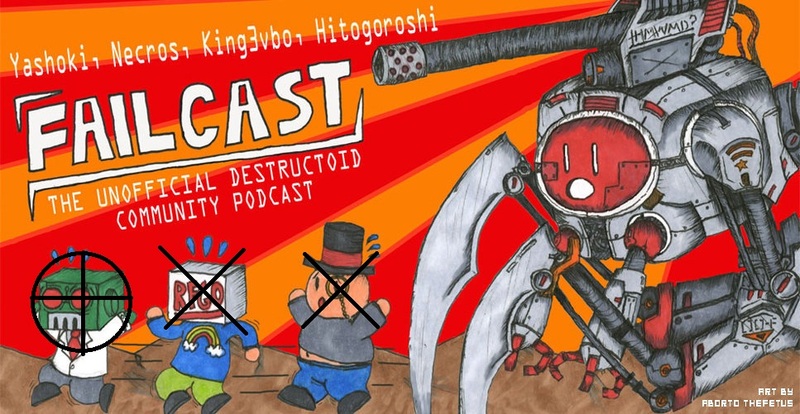 One year ago, on January 17, 2008, we released Failcast episode 0 on the unsuspecting public. And we'd like to say the rest was history, but let's be honest, no one listens to this horrible show. Except for you, dear listener, and we love you for it. Just pretend that you are the only person on the internet who can read this post and we are speaking directly to you, and you'll feel amazingly special for a few seconds. To celebrate our one year anniversary, Failcast invited back community guest Madninja for another go, even if his bad connection kills his participation. Host Yashoki heads our list of regulars, Charlie, King3vbo, and Necros, as well as the parting appearance of Riser Glen from the regular cast. Join us as we actually talk about the community for once and try desperately not to let down the new listeners we might have gained from last week's episode. Also, as you'll hear on the show, we've decided to drop our preview episodes (marked with "beta") from our production schedule, instead releasing a full episode every week. What does this mean? More Dtoiders will get to be on the show in this "second season" of Failcast! Contact us at [email protected] if you want to be added to our (admittedly long) guest list or to submit an audio segment (think of it as a spoken cblog) to be aired on the show. Note: This episode is proudly drama-free, for those of you watching your weight. 30:05 - Correction: examining the different plans and what features Dtoid's account actually has, we believe that this is actually the free feature plan, so please disregard arguments on pricing. 38:15 - The Dtoid Wiki project - Correction: the site is open to everyone's edits, but contact Hamza to become part of the dedicated team. If you haven't started listening yet, downloading this episode is a great time to start!